In Spain there is this wonderful coffeehouse called Café Gijón. It’s located at one on Madrid’s main boulevards. Though probably most of us have never had a chance to visit Café Gijón, it is enough to know the uniqueness of this place lies in its history. Let’s have a quick look at the end of the 19th century, a time when across European capitals, discussing poetry and prose at the table was the well-practiced – not to say fashionable – custom of society. Café Gijón served as one such place, often gathering discussion-thirsty writers, artists and renowned Spanish and international figures from other walks of life. Café Gijón welcomed the literati from Generation ‘98 (the time of the Spanish-American War, 1898), the avant-garde Generation ‘27, the Spanish Civil War Generation (1936) and so on. Enough to say that among the frequenters of Café Gijón were such greats as García Lorca, Salvador Dalí, Camilo José Cela and others who have lent incredible weight to the venue in Spanish intellectual circles. Even today figures like Julio Llamazares and Arturo Pérez-Reverte will sip their tea there, listening to the stories the taberna has to tell. 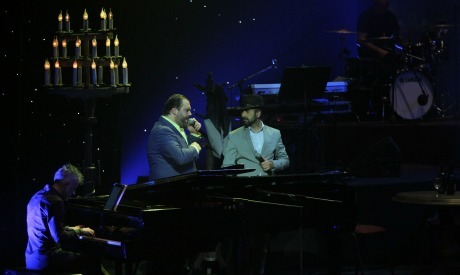 Between 5 and 8 January, the Cairo Opera House brought Café Gijón closer to the local audience through a performance entitled Café Español. The show was written and directed by Maher Zekri, a man who – as he himself reveals – has spent over 40 years of his life in Spain and who was particularly inspired by the place. “We decided to give the show an easier name, something that would be easier to pronounce for Egyptian and international audiences,” Zekri comments, adding that the performance premiered last November in Spain and Egypt is staging its first international appearance. With such promises and Café Gijón as the inspiration, the director of the show took on a large cultural responsibility. Café Gijón, after all, is an important legacy that holds boundless values in our cultural consciousness. The treatment of such an iconic location in any artistic production is a procedure that needs a lot of thought: a great scenario as well as a captivating and culturally convincing story delivered by the best artists. As we cannot forget that at the other end of the production there is a spectator who comes with certain expectations, fuelled by the promises pronounced of the artists themselves. In other words, this historical and cultural weight can also become a trap. Without further ado, let me state that Café Español was an entertainment show. The formula in itself is not a problem if we look at it as a light and very simple spectacle, a performance that provides a series of dance numbers, known covers played by the live band and projections. There is no dramaturgy, no plot, no development of events – just songs and dance. The questions arise however once we try to create a conceptual link with the iconic Café Gijón. It simply doesn’t work. At the heart of our confusion lies the cultural and historical background mentioned in the first paragraphs of this article. The director might rightfully argue that references to the Spanish café were many, in large part expressed through projections. The first half the artists performed in front of an image of the Café Gijón’s façade and, in the second act, the location’s interior is screened, showing tables and chairs. A few physical props, chairs and tables on the stage, a few bottles here and there aimed to add a pub-restaurant atmosphere to the setting. The historical element was also underscored at the beginning of the show with projections of a series of renowned figures serving as a reminder of all those who frequented the café… and those who didn’t, since musicians such as Mozart and Beethoven were among the faces projected. Though the choice of the remarkable artists was at times confusing, the broad selection was a way to open up a wider scope of culture rather than limiting it to one venue. But it is at this confusing crossroad that the link to Café Gijón disappears – easier to think of Café Español as a show presenting a café, located probably somewhere in Spain, which presents some of the best known dance and music numbers from Spain, Latin America and the world. Among many celebrated tunes, Café Español featured Domenico Modugno’s Volare, Los del Rio’s Macarena, Demis Roussos’ Mananas de Terciopelo (Velvet Mornings popularly known as Triki Triki), Consuelo Velazquez’s Besame Mucho and numerous other rhythmic songs easily recognised by audiences worldwide. With the hope of drawing closer to Egyptian listeners, Zekri also weaved in the famous Spanish Caminito tango that was sung by Omar Sharif and Mohamed Mounir’s So Ya So which closed the first half of the evening to great enthusiasm. Divided into very clear segments, the songs were presented in sequences: Classic, International Medley, Latin, Tango, Boleros & Coplas, all the way to the “Humanitarian” segment which closed the show with songs such as We Are the World and finally the performers singing Salam Alekum. The two main singers provided the vocals. On several occasions, they tried and managed to develop a direct relation to the audience, asking the listeners to join in singing or even stepping down into the auditorium. As they did so, the dancers performed choreography by Pablo Arenas, a format which was a sort of amalgam of steps known from Spanish forms intertwined with movements reminiscent of 1970s and 1980s pop music videos. The dancers’ and singers’ hallmark was their unbeatable energy, even if it was maintained at the expense of professionalism and artistic accuracy. It was obvious that a large number of the audience enjoyed the show, clapping along to the songs they recognised and cheering the singers. It is in the nature of simple entertainment to interact with the audience, heat them up, lure them into melodies, colours and energies that are already familiar. Shows such as Café Español neither look for deeper values nor bother to create intellectually challenging triggers. If we agree that Café Español addresses a certain segment of the audience, one that looks for easily digestible music and dance and remains generous to a glitch whether in the singing or dancing department, Café Español served the purpose. It all depends on expectations. 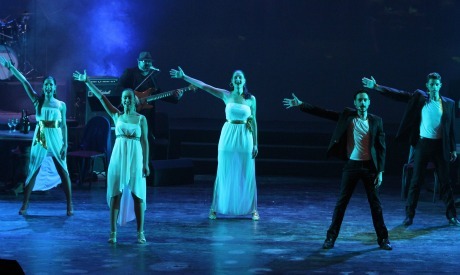 Whether Café Español should’ve been performed on a stage other than what is considered the country’s most prestigious, offering arts of deep value, raises questions among the audience attending this as well as other performances staged at the Cairo Opera House.